Organizing a backyard bash should be relaxing and fun, like the event itself. In the heat of summer, a little goes a long way, and these easy DIY decorations require minimal effort to transform your back patio into party paradise. Plus, for the crafty set, each of these DIY party decorations is a pre-party occasion unto itself—so invite some friends over to help, and make a night of it. Personalize your outdoor candles using ceramic and glass dishes you have around the house. Skip the luxurious, over-priced candles and have some fun making Free People’s DIY Surf Wax Candles. These easy-to-make candles are perfect for a seaside feel with the scent of surf wax, a mix of sweet coconut and sea salt. Whether you are grilling out or sipping smoothies on the back deck, these west coast candles will give your patio a vacation feel all summer long. Celebrations’ Super Easy DIY Palm Tree Straws are a kid-friendly craft only requiring paper straws and cardstock. Every summer needs at least one backyard luau, and these bright and bold straws are an easy way to add an extra touch to your Hawaiian décor. One look at these drinks and everyone will be relaxed and ready to limbo. Throw a sophisticated cocktail party in five simple steps. 100 Layer Cake’s simple Feather-topped Drink Stirrers are delicate and feminine, and they will dress up your bar cart without calling for too many materials. Simple is always better and cheaper! The warmer months generally mean wedding bells will soon be ringing. The DIY Rose Garland from A Pair & A Spare is one of the easiest and low-cost decorations you could make for a summer bridal shower. Choose the bride-to-be’s favorite color for the roses and hang this romantic garland along a porch rail or entwine the rope through a buffet. Fill your outdoor table with Eighteen25’s Pretty Recycled Flower Pots for a quick and inexpensive way to add a lot of color and texture to an empty tablescape. Save money using recycled cans and wrapping paper or scrapbook paper. These flowerpots are perfect for a Sunday brunch, and you will be able to use them all summer long. 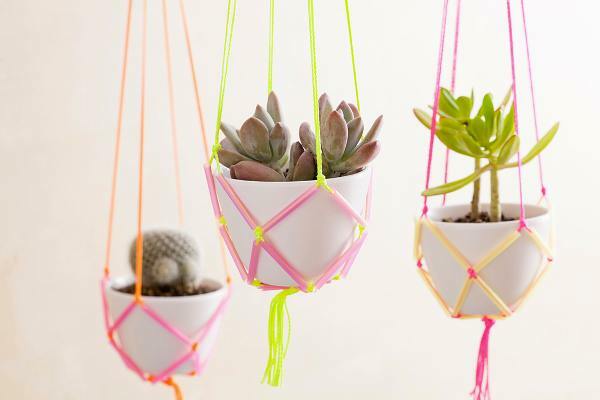 Brit + Co.’s Easy DIY Hanging Planters are made with household supplies—think super inexpensive twine and plastic straws—yet look like something you could find in an exotic marketplace. This surprisingly easy decoration is versatile for any party, but the neon colors feel like it’s time to celebrate someone’s birthday. Turn simple white napkins into formal dinnerware with Punched Leaf Napkin Rings. The little green leaves fit right in for an outdoor candlelit dinner. Oh Happy Day shows us how to personalize each napkin ring for a special touch. Interested in more inspiration for fabulous style on a budget? Check out these Hot Summer Looks Under $50 and our Q&A with Budget Style Blogger Patrice Williams. Or watch below to learn how make charming fruit-studded ice cubes for your next occasion!